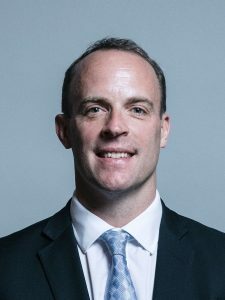 Brexit Secretary Dominic Raab has set out what he called “practical and proportionate” advice in case the UK leaves the EU with no deal. Ministers say reaching a deal is their top priority but that “short term disruption” is possible without one. There remain major issues related to Ireland (and Gibraltar) whether or not there is a negotiated Brexit (watch also Brexit and the fate of Northern Ireland, Gibraltar, the UK, and the USA). The UK has been hoping to come up with some type of plan to leave the European Union that will not hurt it. One was proposed, but has essentially been turned down by the EU (see UK hopes a weakened proposal may prevent a hard Brexit). And yes, there will be some trade, at least, between the EU and UK even with a hard “no deal” Brexit. Since one report I saw today says the EU exports more to the UK than the UK exports to it, this should motivate some in the EU to make some trade arrangements (money talks). Yet, the Europeans want the UK to pay a big price for Brexit. They do not want any other EU nation to follow the UK’s lead. Hence, yes, the EU is willing to take losses because of this. It also thinks that the UK should have been much further along in negotiating with the EU, plus that the UK should accept pretty much everything that the EU wants. Various ones in the UK disagree. Mr Maas made the provocative suggestion in an opinion piece for Handelsblatt, a German business paper. He said: “Where the US crosses red lines, we as Europeans must counterbalance. For more on Heiko Maas’ financial comments, see my post yesterday: ‘Germany Calls For Global Payment System Independent Of The US’. The idea that “The US under Donald Trump will not play the same role that it has in the past,” has become a recurring theme among EU, and particularly German, leaders. Brexit and Donald Trump are significant factors in getting Europe to turn away from the UK and USA. As I have been writing for some time, initially, I do not expect that Brexit will result in doomsday for the UK. Oh yes, there will be disruptions and paperwork issues. And yes, the UK may have an economic crisis. But of themselves, those are not real doom. The real doom will come after Europe reorganizes and the Beast arises in Europe (Revelation 17:12-13). Europe will then takeover the USA (Daniel 11:39), as well as its Anglo-Saxon descended allies (cf. Jeremiah 30:7; Daniel 8:23-25a), including the UK (cf. Isaiah 17:3). The Great Tribulation, which I have called, World War III will come. Brexit and Donald Trump will be factors. Despite what British and American politicians hope for, the world, under European influence, will turn against the USA (cf. Daniel 11:39; see also USA in Prophecy: The Strongest Fortresses) and the UK (Daniel 8:24-25; Isaiah 17:3). This entry was posted on Thursday, August 23rd, 2018 at 3:00 pm	and is filed under Prophecy.